The 737 MAX aircraft upgrades one of the most utilized and popular aircraft in the world. New technology, increased range and versatility, and the addition of the LEAP-1B engines have been added to this variant of the 737. This course provides detailed information on all the aircraft systems to include interactive diagrams and displays in accordance with the manufacturer’s flight manual. As with all our online pilot training courses, this Boeing CBT class includes 24/7 technical support and customer service. This course is available in LEAP engines. 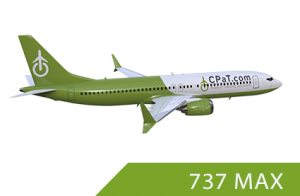 This Boeing CBT Course is delivered on the CPaT Mobile Application using our Play Ready Technology (PRT) and will operate on PC, iOS, iPad, iPhone, Mac, and Android computers, tablets and devices. This course can be used both On-Line and Off-Line and will synchronize when connectivity is re-established. This course meets FAA, EASA, ICAO and DGCA requirements and it complies with IOSA Standards.